I remember when I was living in Charleston hearing about a someone journaling. I thought that sounds so awful, like a writing in a diary. I was reminded little book with a locket that I would write everything from the day. Today I …_____. Yuck. It just didn’t sound like something I’d want to do. But like many things that I didn’t like at first, it has become something I’ve gained a taste for over time. Slowly over years I had a change of heart. First, a friend shared with me how to use a journal. He told me not to write everything down, only the important ideas. That opened up a whole new way of thinking about a journal. My first attempts were a bit awkward. Sometimes I picked up the habit for a bit and then dropped it for months. As the years went by it slowly became a more significant spiritual discipline. Here’s why I am committed to journaling regularly. When I write I am more active in my thinking. There is something so much more solid when I see it written out than simply in my head. When I journal I can write down my application. By having it on paper I find I can prompt myself to live it out. Eugene Peterson said in his Twitter feed, “The most important question we ask of this text [the Bible] is not, “What does this mean?” but “What can I obey?” When I write down an action step I’m much more apt to obey. I have found that journaling slows me down. When I slow down I think more deeply. This process is very satisfying. It’s working in the not urgent but important quadrant which Steven Covey says is the most enriching type of work we do. A journal is a great way to write out your prayers. If you’ve never prayed this way try it. I use the acronym Knute Larson encourages P-R-A-Y. …Praise, Repent, Ask, Yield. Just write your praises, confessions and petitions. Don’t worry about punctuation or spelling it perfectly. Just get your prayers on paper. It also is a great place to write down prayer requests others ask you to lift up. I got this idea from Steve Bucy, who I served with at The Chapel. I noticed when I shared a request he wrote it down on his journal. Sometimes a month later he’d come back and ask, “How did ________ go?” I was stunned I hardly remembered I had asked him to pray this way. Using a journal will give you your spiritual story. When I review my journal I remember what I’ve been thinking about, my joys, what I’ve struggled with, what I’m learning. 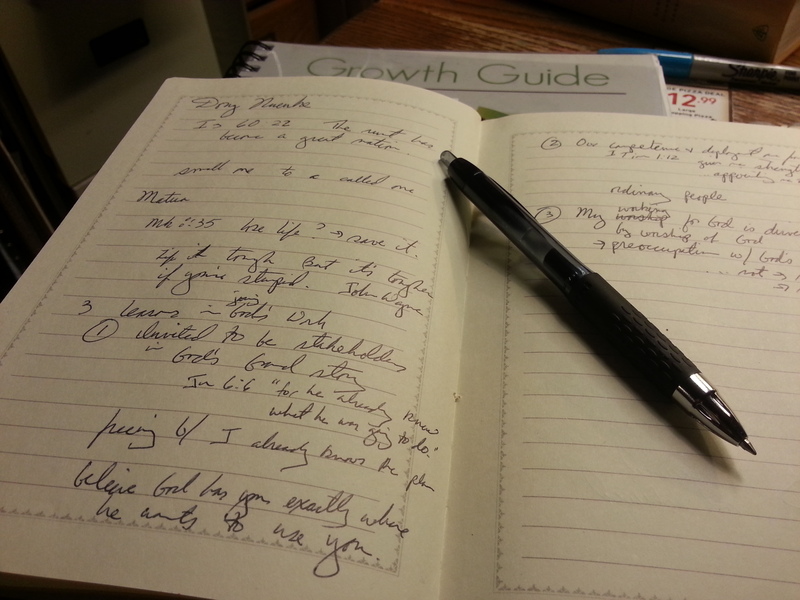 I quickly forget what God has been trying to teach me, so journaling helps me. When I review I begin to see the ups and downs between day to day. I recently reviewed my writings. I was surprised to see one day I was full of faith and trust. Then the very next day I was stumbling and struggling. Those two days teach me life is a battle with lots of twists and turns. As I look back in my journal I find that recurring themes pop up. I find I bump into the same ideas over and over again. That keeps me humble at times and reminds me of the important things God is teaching. I found as I reviewed this past week that worship kept coming up in my writing over the last four months. I found it in the verses that were significant. I saw it in my written out prayers. Some days I sensed my ability to worship was lacking. I learned looking back that the Lord has been working to teach me about worship over these few months. Finally when I look back I find I can learn something new, something I didn’t get the first time around. When Matua Mahiaini, the International President of The Navigators spoke at the National Staff Conference I wrote some notes down from his talk. It wasn’t until a few months later that I returned to it and considered it again in light of what God was teaching to me about worship that it popped off the page for me. I was grateful I took the time write my notes in my journal and came back to it. God taught me what I missed the first time.